To See – To Do | Photodam.nl. The photoblog, live from Amsterdam. Amsterdam is a metropolitan with a lot of things to see or to do. You can go to one of the many and famous musea, see Amsterdam by (guided) bike tour, visit ‘De Jordaan’ a part in the centre of Amsterdam where the city started over 735 years ago, relax in one of the parks, have a beer or coffee at a terrace and look at the people cruisin’, visit a theatre or concert or just a small act in a small comedy-house, visit the Red Light District, smoke your joint in a coffee shop, listen to real Amsterdam music in one of the many cafe’s or just walk through Amsterdam and see his beautiful canals, Golden-century-houses, animals, people and all other things. Wow, so many things to see and do. And it’s just Amsterdam, ‘s worlds smallest capitol (well almost…) Amsterdam is thé place to visit! But, please behave yourself, there a a lot of people (locals) living at this small area too! I’ve made a selection of places to see or do in Amsterdam. From December 2003 to April 2013 the Rijksmuseum Amsterdam has undergo the biggest rebuilding, renovation and modernization program in its history. Saturday April, 13-2013 it has open her doors for visitors from all around the world with the most beautifull art! Over 800 years of art will be shown in 80 rooms. It has 8000 pieces of art! The Rijksmuseum is open every day from 9:00 to 17:00 h.
The Stedelijk Museum at Paulus Potterstraat is a contemporary artmuseum, the best in Western Europe! The big renovation and extension is finished and is was worth waiting for. Classic Modern highlights from the collection are in the Stedelijk Museum! Lots of contemporary art is shown there too. The SM is open every day from 10:00 to 18:00. Evening: Thursday untill 22:00 h! A visit to the Van Gogh Museum is a unique experience. The museum contains the largest collection of paintings by Vincent van Gogh in the world. It provides the opportunity to keep track of the artist’s developments, or compare his paintings to works by other artists from the 19th century in the collection. The museum also holds an extensive offer of exhibitions on various subjects from 19th century art history. The Van Goghmuseum is open every day from 9:00 to 17:00 h.
Anne Frank, she is world famous about her dairy she wrote during World War II. March 15 through October 31: Daily from 9:00 am – 9:00 pm, (Saturdays from 9:00 am – 10:00 pm). In July and August the museum is daily open till 10:00 pm. November 1 through March 14: Daily from 9:00 am – 7:00 pm (Saturdays from 9:00 am – 9:00 pm). Albert Cuypstraat between Ferdinand Bolstraat & van Woustraat. A real Amsterdam market with fish, meat, grocery, clothings and many more goods you need to see! Locals will get their shopping because a lot of bargains are here to get. At the end of the day the real bargains will come but can you wait that long?? Also at this market a lot of foreign food and goods like Maroc, Turkish or Carribean. 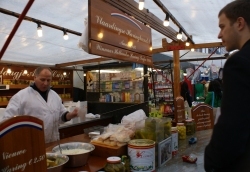 Over 260 marketstands in the longest marketstraat of The Netherlands! Typical Amsterdam sense of humour and laid back atmosphere. Every day, no market on sunday. A modern Amsterdam bar. It’s a ‘home’ to a lot of locals but more and more tourists knows where to drink a nice glass of beer, spirits, wine or softdrinks. A cozy and relaxing place. If the weather is okay, you can visit the terrace, nice and sunny. Drinks, barbites and kindness; all at one place. Say hello to them from me, Ton Photodam! In one of the most wanted shoppingstreets in the Jordaan is Jordino an esthablished icecream atelier. But not only Italian Icecream, it’s an chocolate-artist aswell! The Haarlemmerdijk is an extension of The Haarlemmerstraat. A great shopping area with nice and exclusive stores-street at the westside of the Central Station. Say hello from Photodam to the attendents! A typical Amsterdam ‘Eetsalon’ where the real dutch ‘van Dobben Croquette’ was founded. But not only the rolls with the ‘van Dobben Croquet’, also rolls with: warm vlees met satesaus, Broodje Half-om, Broodje Ei met Ui, Broodje Osseworst, Uitsmuiter, Broodje…. You’ll name it, they make it! Typical Amsterdam Sandwiches but great meals too at van Dobben! There is a ‘van Dobben’ near the Albert Cuyp market too. Van Dobben: since 1945! The red Light Districs of Amsterdam are free to visit, well; if you stay outside! This is one of the places amsterdam is famous for! Do enjoy a walk across the alleys, the red-lighted-canals and the covered places. If you are looking for more, just ask the princess of your dreams what the price is for your moment of fame and happiness! (€ 50.– will do). Please don’t make pictures of these workers. You’re camera won’t be the first who’s going to swim in the canal, No return policy! In 23 seconds you’re at the skydeck. Just the elevator is a “trip-to-do” in Amsterdam!!!! Don’t forget to see my eveningphoto’s at the windowscreens! Enjoy the view and don’t forget to get your camera/smartphone with you. But there is more in the Big City! 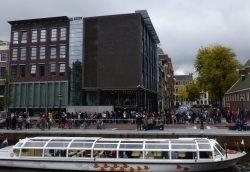 Find all the information and places you want to see in Amsterdam at the Tourist Information office opposite the Central Station.